Their comments came after data late last month that showed core inflation rose 1.7 percent in the 12 months ended in January. Indeed, even the Fed’s Vice Chair Stanley Fischer has warned inflation is coming… and the Fed wants it! Now, consider that core inflation is already ABOVE the Fed’s desired target of 2%… at a time when Oil and other commodities (including those used in food) are at 19 year lows!!! Imagine what will happen if Oil and other commodities continue to rebound! The Fed is cornered. If core inflation continues to rise the Fed will be forced to raise rates, kicking off another Depression. 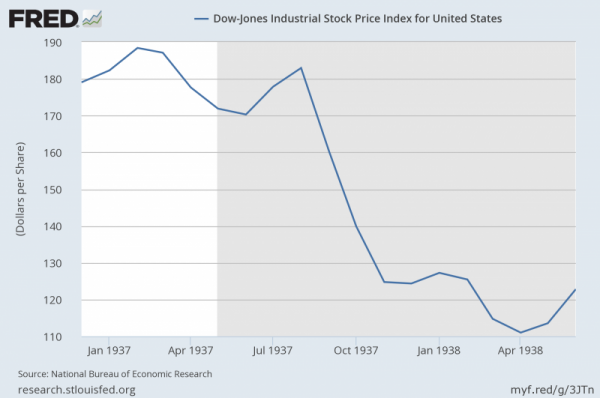 By the way, in the 12 months after the Fed hiked rates in 1937, stocks fell 40%.